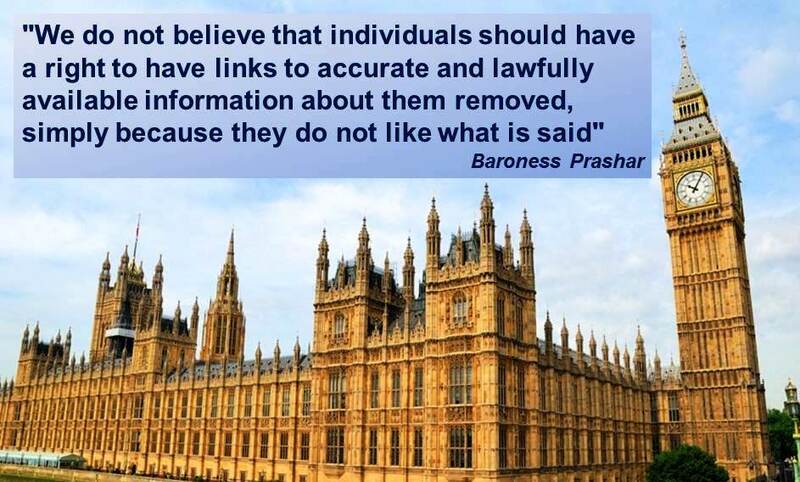 The bold statement “The Right to be Right to be Forgotten is Wrong, Unworkable, Unreasonable” is commendable and it comes right from the top of an old institution, the UK House of Lords. The pushback to invalidate the CJEU ruling is timely and welcome. Making the conveyor of news, in this case Google, the judge of what is correct or incorrect is absurd. The process involves an army of individuals whose judgments of what should be deleted or not, is now pushed into the realm of subjectivity. Europe’s right to be forgotten ruling, which states that everyone has the right to wipe their digital slate clean, is simply “wrong”, a House of Lords report has concluded. As a result, it argues, Google has been faced with an “unworkable and unreasonable situation”. The Lords EU Sub-Committee — which deals with topics as disparate as immigration, health, sport and education — delivered this bold statement after consulting with the Information Commissioner’s Office, Minister for Justice and Civil Liberties Simon Hughes and Google, amongst others. In a lengthy statement, Chairman of the Sub-Committee Baroness Prashar said the reality was “crystal clear” — “neither the 1995 Directive, nor the Court of Justice of the European Unions’s (CJEU) interpretation of it, reflects the incredible advancement in technology that we see today, over 20 years since the Directive was drafted”. The report supports the UK government’s own stance that new regulation needs to invalidate the CJEU ruling.